Brussels (AFP) - Iran's foreign minister said Tuesday that efforts to save the nuclear deal after the abrupt US withdrawal were "on the right track" as he began talks with European powers in Brussels. Mohammad Javad Zarif met EU foreign policy chief Federica Mogherini ahead of evening talks with his counterparts from Britain, France and Germany -- the three European signatories to the 2015 landmark accord who are scrambling to preserve it. Tehran has warned it is prepared to resume "industrial-scale" uranium enrichment "without any restrictions" unless Europe can provide solid guarantees that it can maintain the economic benefits it gained from the nuclear agreement despite the United States reimposing sanctions. 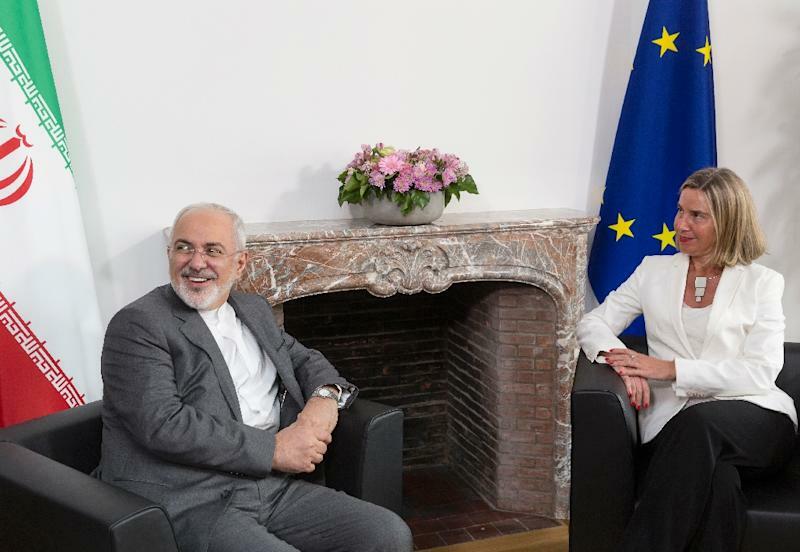 Zarif gave an upbeat assessment after a "good and constructive" meeting with Mogherini. "I believe we're on the right track to move forward in order to ensure that interests of all the JCPOA remaining participants, particularly Iran, will be preserved and guaranteed," he told reporters. The deal's official name is the Joint Comprehensive Plan of Action, or JCPOA. Mogherini said it had been a "very productive" meeting but indicated it was the start of a long road. "We are working on the measures that we can start to put in place and we will look at the content of that," she said. "One thing is absolutely sure is that the European Union is determined to preserve this deal that is essential to our security and the security of the region." Zarif's meetings in Brussels cap a whirlwind global tour, including trips to both Russia and China, the two other signatory nations, in a bid to bolster support. European diplomats have sought to play down expectations of Tuesday's meeting, stressing the enormous challenge of finding a way around US sanctions punishing foreign businesses trading with Iran, which have global reach. Mogherini and European Commission chief Jean-Claude Juncker will outline to the leaders what measures the bloc could take to shield its now substantial economic interests in Iran, he said. European firms, especially those from France and Germany, rushed to invest in Iran following the 2015 accord, under which Tehran agreed to freeze its nuclear programme in return for an end to punishing international sanctions. German exports to Iran totalled nearly 3.0 billion euros in 2017, while French exports soared from 562 million euros in 2015 to 1.5 billion in 2017 and oil giant Total has pledged to invest some $5 billion in the South Pars gas field. Washington's decision to go against its European allies' advice and abandon the deal has pushed them closer to Beijing and Moscow on the issue as diplomats try to keep the pact alive. French President Emmanuel Macron held phone talks with his Russian counterpart Vladimir Putin on Tuesday, according to a Kremlin statement, which said they had "confirmed Russia and France's commitment to make the deal work". Zarif was in Moscow to meet Russian Foreign Minister Sergei Lavrov on Monday, a day after visiting Beijing. Washington has long complained that the nuclear deal does nothing to stop Iran's ballistic missile programme or its interference in conflicts across the Middle East from Syria to Yemen. On Sunday, US Secretary of State Mike Pompeo said Washington still wants to work with Europe to counter Iran's "malign behaviour" and was working hard to thrash out a more wide-ranging deal with its European partners. However on Tuesday the US hit Iran's central bank governor with sanctions. Ahead of Tuesday's meeting, British Foreign Secretary Boris Johnson said the European powers would not shy away from pressing Iran on these issues. "Our meeting with Iranian Foreign Minister Zarif in Brussels is a chance to discuss how we can continue to support sanctions relief with Iran while they maintain their nuclear agreement obligations, but also raise our worries about Iran’s wider, disruptive behaviour in the Middle East region," Johnson said.